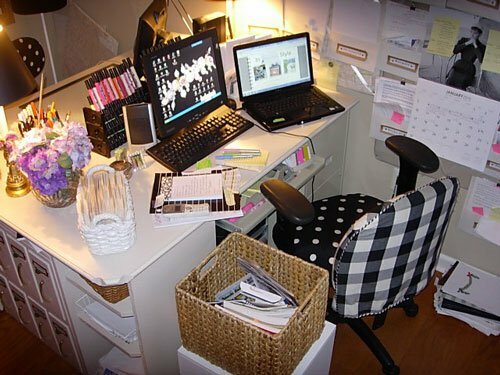 Do you have a home office that serves as you and your spouses work area but can’t figure out how to share the space? Sounds like you need a Partner’s Desk. Coming over from funky junk….. wow… that is amazing that you built that. I am love, love, loving it! All those markers and pencils get me going since I am a painter. Stop over to my blog sometime! What a wonderful work space and I too would not share with anyone…great job! Are you kidding?? That is amazing!! What a fantastic project and it is AWESOME!! I am so jealous of that desk!! You’ve got my mind spinning with ideas now. Thanks so much for the link! 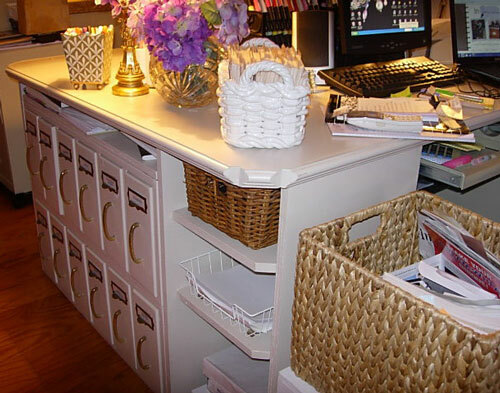 Those file drawers are making me DROOL! So awesome! The white is so clean and fresh. Hi Sherilan- Yes, I made the chair covers. I am going to post how I made them, probably next week as I show a few more parts of my craft space. Thanks for the nice comments. I just found your blog and really love it. I was going through some of your older post and found your “Getting Organized” post and love it, especially the chairs. Did you do that and have you put on your blog how you did it? Can’t wait to keep reading. wow! i need a place like that! Thanks everyone for the wonderful comments. I wish I had some before pictures to show you and some while the desk was in the construction phase, but we made it a few years ago. Lynn- I cleaned out my basement this summer and threw out tons of stuff. Of course now I wished I saved some of the items. I have come to the conclusion -as soon as you throw something out- you need it or find a use for it. What a great space! I love the desk. Wow! I love your partners desk. Your space looks amazing! I love how you have it organized…very cute! Thanks for sharing your ‘job well done’. Happy Holidays! This side of my office looks neat- you should see the other side. With my husband’s stuff now taking up residence, it needs some re-organization. I will post more soon. As for the colored pencil holder-I found instructions for it in an Artist’s magazine a few years ago. My dad made it for me. It is really quite handy. Thanks for the comments, they really made my day. I can’t believe you made that desk (I mean – I DO believe it, but it’s awesome!). :-) Love the storage on the end too and the way you organized it. 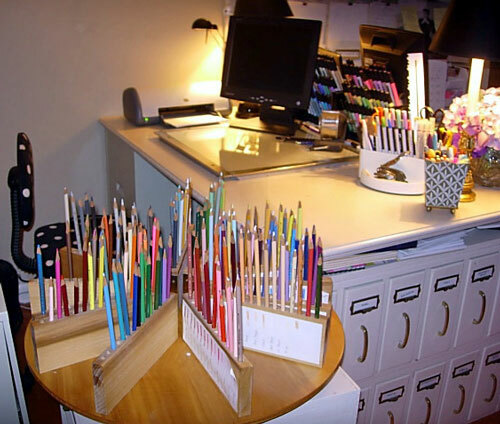 Did you make the colored pencil organizer too? That’s pretty clever. Thanks for joining the party and welcome to blogland! Wow, what wonderful organization going on in your space. I love the “partners” desk but I must admit I wouldn’t want to share that beauty with anyone. I’d want it all to myself-lol. I love all the little compartments. Great looking space and photos. Diane, this partners desk is just the best thing since sliced bread! You and your husband did a fantastic job designing this gem. I love how you incorporated the old files and then gave them new tag holders. Your workspace looks so neat and tidy! Congratulations on a job well done!